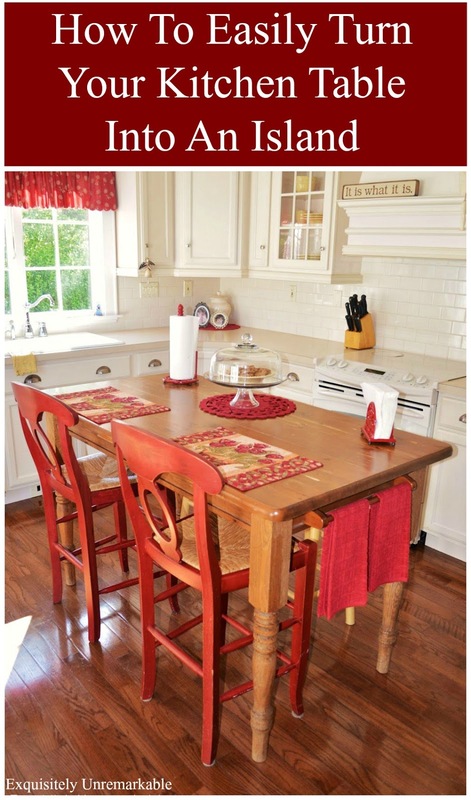 Turn a plain farmhouse table into a kitchen island with this easy, inexpensive trick. You don't need traditional legs. I have a lovely farmhouse island in my kitchen. It is the most useful and utilized piece of furniture in my home. 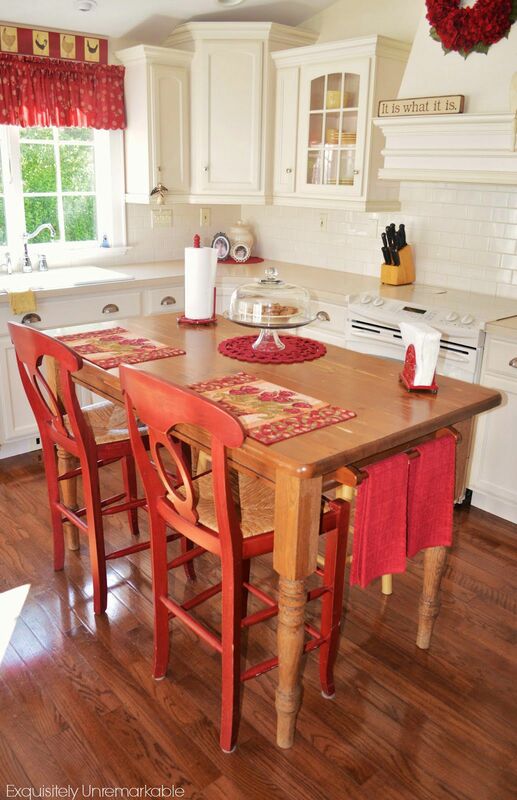 While there is another table in the kitchen and a full desk area as well, that island is the place where my family eats most meals, prepares food, makes Christmas cookies, decorates Easter eggs, carves pumpkins, plays games, does homework and gathers for conversation. It is the physical and emotional center of the kitchen and a beautiful, decorative focal point as well ~ the perfect combination of form and function. Of course we cheated our way to this fabulous look. How you ask? You see, this piece didn't start its furniture life out as an island. Many years ago, I worked at Pottery Barn and with my stellar employee discount I was able to get a farmhouse table for next to nothing (almost free ~ really!!). 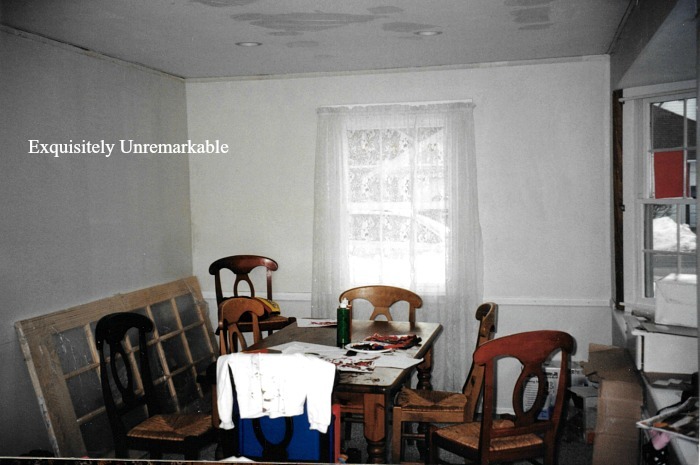 The table was returned and supposedly damaged, although I have never seen any imperfections. We used it for years in our first house, but when we moved, I wanted a round table and my lovely farmhouse (almost) freebie was retired to the basement after we turned this old dining room into a family room. When our kitchen renovation was complete, the space was clearly missing an island, so I started shopping, but couldn't find one to suit my taste and my budget. Then I remembered my table. We brought it back upstairs, as the style was perfect, but obviously the height was all wrong. We figured if we replaced the legs with longer ones, we would have a fabulous island. We looked for furniture legs online and in stores, but again, they were very pricey and very ornate. 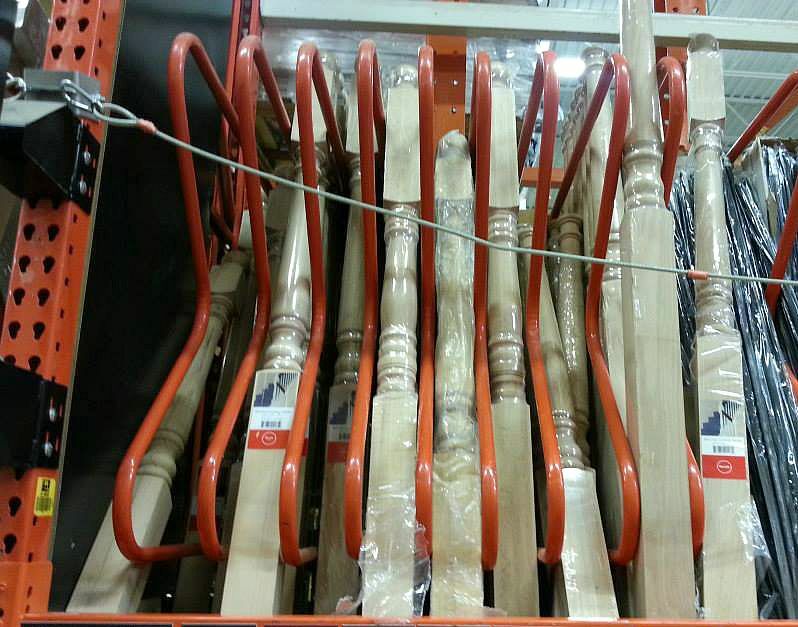 One day while shopping in Home Depot, we walked by the stair balusters (newel posts) and realized that if we turned them upside down, they looked exactly like furniture legs. Even better, they were cheap, came in a variety of sizes and had the simple style we desired. We cut them to the proper height, notched them so that the bracket from the old legs would fit, stained them to match the table and we had an island! 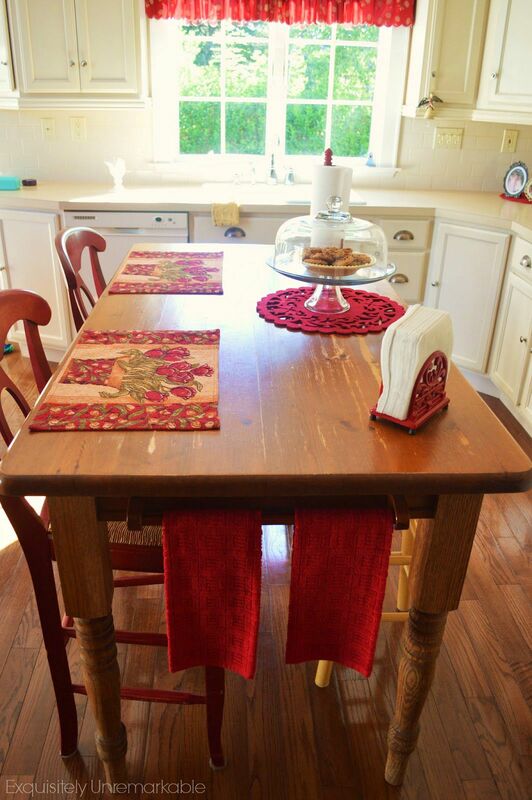 The table is pine and the balusters are oak, but you would never know. To make the piece a little more functional, we picked up some cheap wooden towel bars and screwed them into the table. They came prefinished and the stain was a perfect match. I had one red Pottery Barn barstool from the discount days, I picked up the second one at the outlet. The two backless stools are from Bed, Bath and Beyond, $30.00 for both, I had a coupon (of course). To buy a solid wood, farmhouse style island would've cost me hundreds, possibly thousands of dollars, for a fraction of the price I was able to convert my old table into a really great piece, that actually still has my kids' carvings in it...something I couldn't pay for anyway! It's been a few years since this project was tackled and honestly, the table is in desperate need of a refinish. We are hoping to get that done this spring/ summer...although I still want to keep the kids' artwork intact! We liked the look so much that we returned the legs that came with the desk, from the cabinet company, and used the balusters there as well. We turned them upside down again, painted them to match the cabinets and voila, custom furniture legs! So if you're looking for a rustic farmhouse workspace, don't pass up that yard sale table. 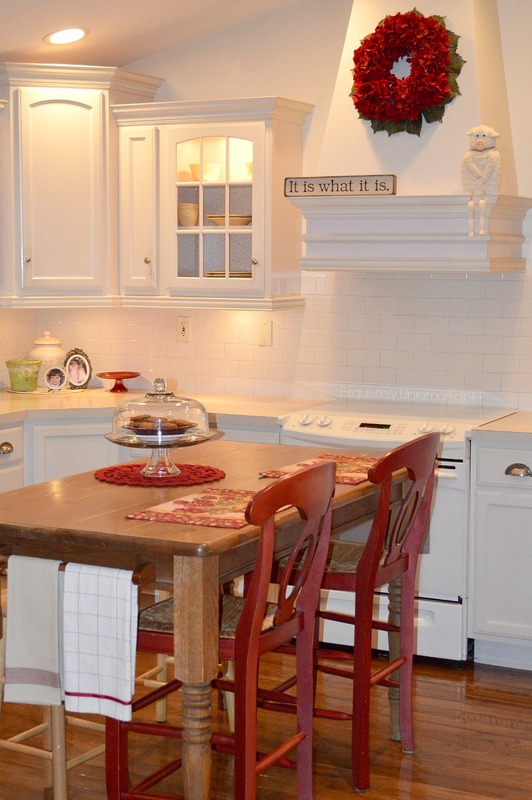 It could be the kitchen island of your dreams. Looking for more cheats or farmhouse style? Good Evening Kim, My word you are a creative husband and wife team. I would never have thought of using balusters as legs. Looking at the table I would have had no idea that they were mismatched. I love the fact that I am collecting tips from you.... I am putting the ideas away for a time when I will need them. Daphne, you always have the kindest comments! Thank you so much and I am glad that you have found something helpful here! Have a lovely weekend! Thanks Karen! I love getting pinned! This is really beautiful. I love the kitchen and I love cheat #3. You are gifted! Looks great, Kim! We recently had our stair railings replaced - if I had known you then I could have saved my old balusters for you. Who knows what else you could have created! You are a fricking genius! I never would have thought of that, which is probably why your house is so stinking adorable! thank you thank you thank you!!!!!!!!!!! 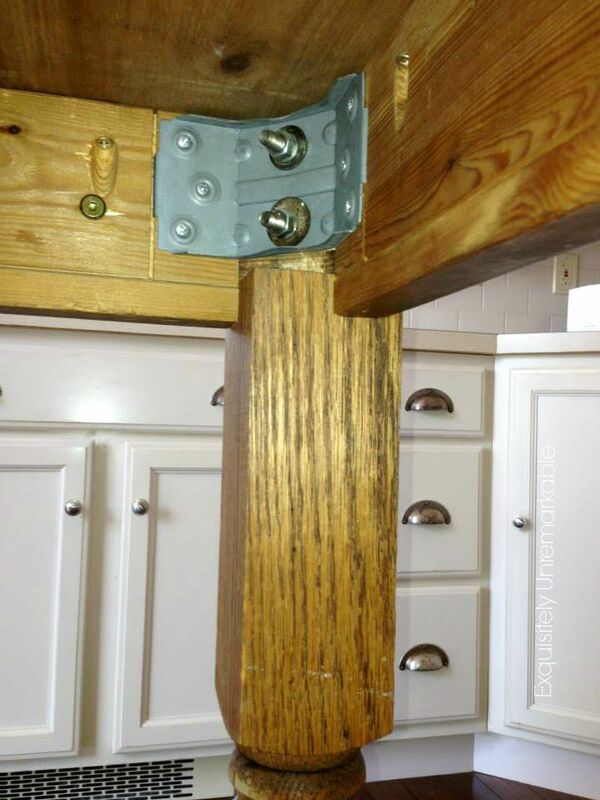 I want new legs for my dining room table but they're so expensive and I don't want to use dimensional lumber. I've never seen balusters that chunky before but I'm now on the hunt! Anne, you are too sweet! I can totally relate though, when we were trying to figure out how to make this tabletop work and I found the balusters, I was ecstatic! We found them at Home Depot, right next to the hand railings. I hope you have luck! Keep me posted! 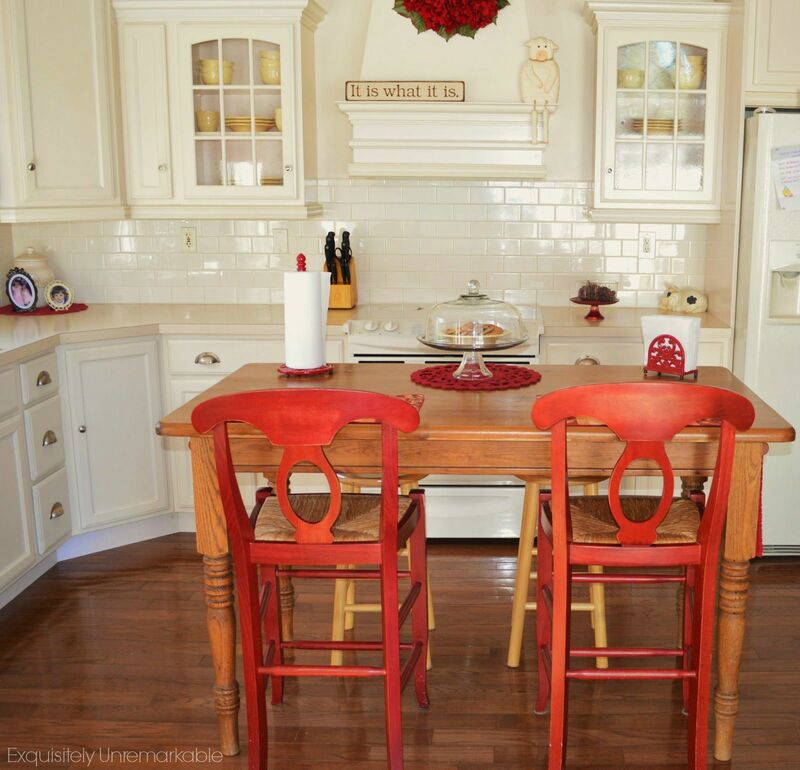 What a gorgeous red and white kitchen! The wreath and the rooster sign are adorable! You and your hubby are DIY decor super heroes! I'm done with furnishing my home (for now! ), but will definitely keep this smart tip in mind! Thanks for sharing! All I saw was GORGEOUS and GENIUS! Thanks!! Holy cow. Is that your kitchen? I'm having some serious kitchen envy right now!!! Your blog is beautiful! Thanks Julie ~ you just totally made my day! 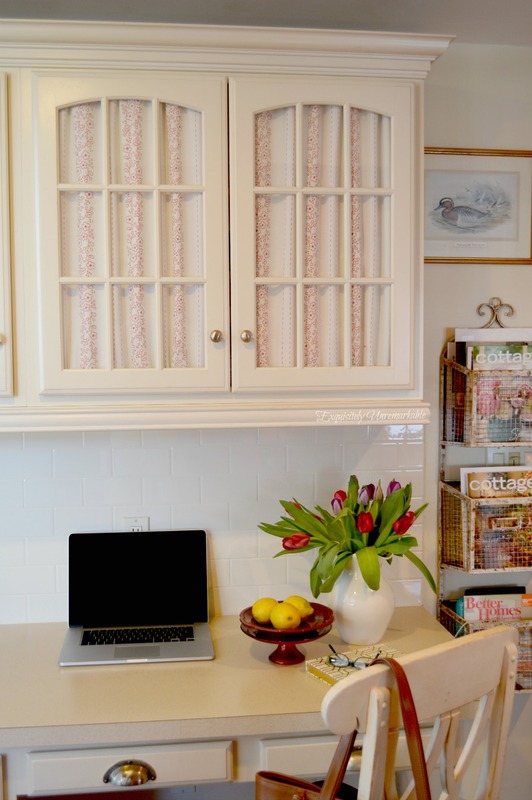 I'm glad that you like my kitchen, but even more excited that you like my blog! Such a great tip! I've shopped for furniture legs before with little luck -- next time I'll be heading to the balusters! I do not have a railing in my home, so I had never shopped for them before, but they really are everywhere and lots of styles to choose from! Happy hunting! Wow, that's so cool! I don't think I ever would have thought of that solution to make the table taller! Thanks Rachel, I didn't think it was really all that creative, until I blogged about it. Most people seem to think it's really out of the box! Who knew? 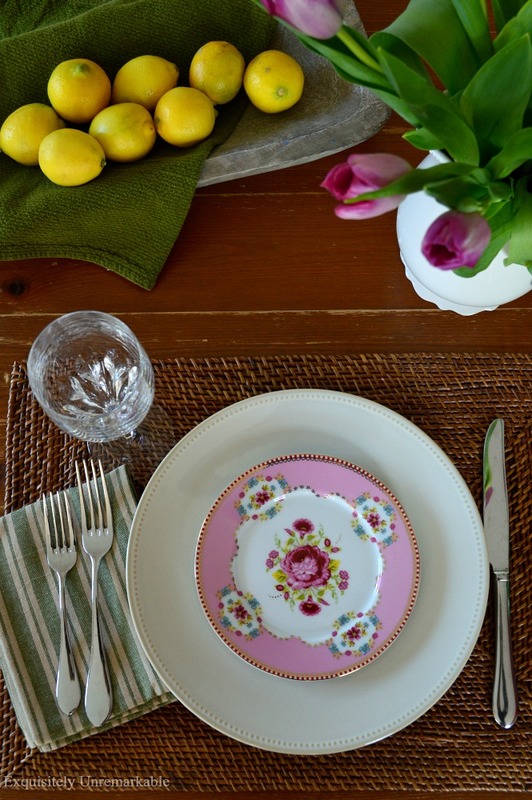 Southern Living!?! Woo hoo! Thanks Cyndi and thanks for popping by! Love your blog, stellar writing! I want to do this in my moms new summer cottage. It would be so perfect for eating and working. 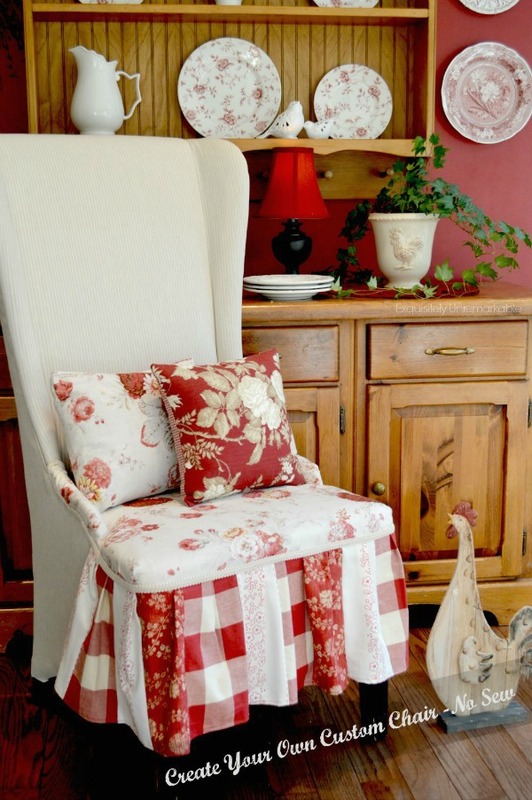 A summer cottage sounds lovely, with or without an island, but it is a very functional piece! Thanks for coming by! This is a fabulous idea. I will be stealing this. I love your kitchen. Red is my favorite color. Awesome tip! Your kitchen is beautiful. You are very kind! I am so glad you like what you see and I love reading all of your comments Tracy! Great use of the posts for legs! Thanks Donna~ it was exciting to find something that worked! Great idea!! You did such a good job ;) Thank you so much for sharing at Give Me The Goods Monday! Thanks Jamie, it's always a great party and, hey, thanks for featuring my Farmhouse Kitchen Island! How exciting! I love this idea. Everyone wants a custom piece of furniture and you made it easy to look outside the box in a way to get it. BTW: love your site. Gorgeous! Peeking in from Oh, Mrs. Tucker! What a great idea! The legs looks like they came with the table! Love the towel holder on the end as well! Thanks so much Katie, I really like those towel holders too! They come in very handy in a busy, messy kitchen! Thanks for stopping by my blog! Wow, what a creative solution! Not only does it look great, but it sure was thrifty too! Thanks Sharon! It was a bargain, that's for sure! Thanks so much for popping by to take a look at it! Love it!!!! I get so attached to furniture my kids have "distressed" too. Especially tables for some reason. You are right! You can't buy those kid marks or the memories of Christmas cookies, etc. I love how you described your island! Mine is all wrong at the moment and it does make such a difference. A kitchen redo is ongoing at our house right now. Little bits and little changes at a time as funds, time, etc. allow. Thanks for sharing. Jessica, I fought with my husband about those carvings, can you believe he wanted to sand them out! ;) I am sure that you will end up with a lovely island when your renovations are done! Good luck, I remember what a process it can be~ but all worth it in the end! Thanks Korrie! It definitely solved my island problem! Thanks so much! It was an idea born out of necessity~ and a little luck at Home Depot! Lovely kitchen and great idea using the stair balusters for legs! Thanks so much for joining the Rock 'N Share party...hope to see you again soon! Blessings, D@TheShadyPorch P.S. - Following via G+ and Twitter. Thanks for the party, the follow and the lovely words, D! They are all appreciated! Really creative idea! Love it! I also love your red stools .. 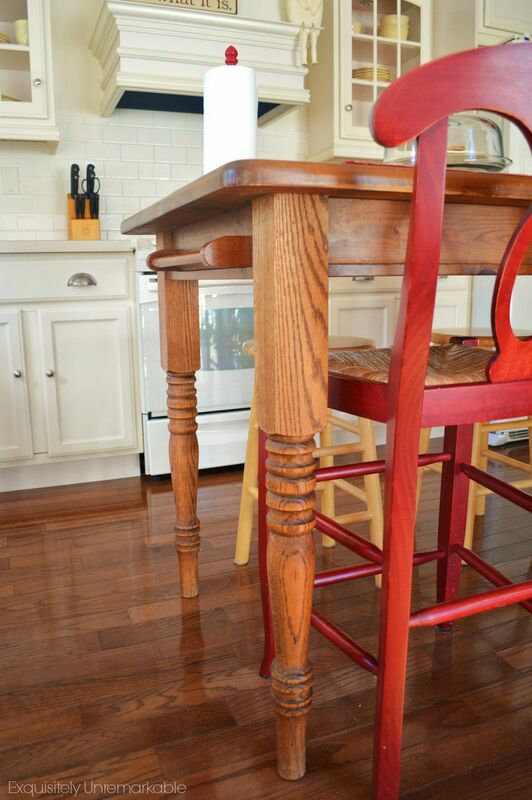 I am about to refinish mine and was going to use red paint, but love this red stain. Did you do it yourself? If so, what is it please? Marilyn, I would love to take credit for those lovely red stools, but they are from Pottery Barn and they came right home from the store in that color. I can tell you that I did work at Pottery Barn and they are very open with their colors and if you call them they will tell you what color stain they used, if they can. Good luck! What a great idea, I never would have guessed, they are beautiful!! Thank you for linking up to my Furniture & Paint Party! Hope to see you again soon. It's my little cheating secret, Brooke! ;) Thanks for the party! 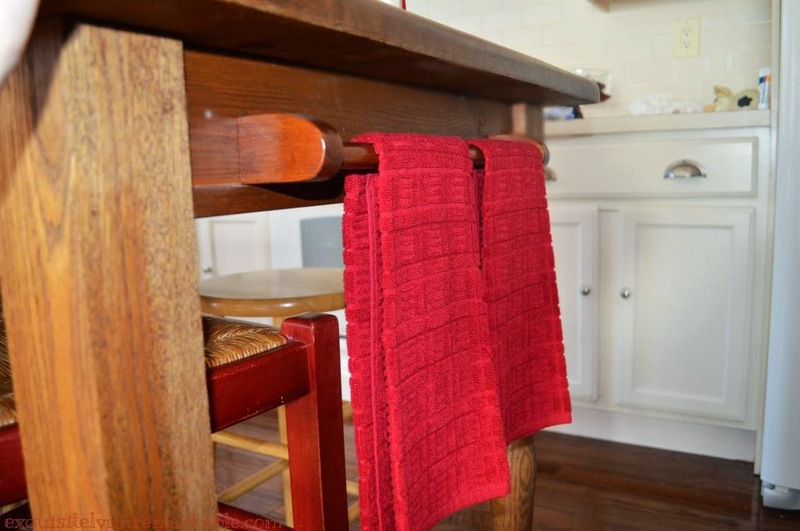 What did you use for the towel racks? They are basic wooden towel bars from the bathroom aisle at Home Depot. What a nice idea! I really like the balusters to legs thing. I don't have a kitchen big enough to have an island. I do use an old drop-leaf farm table as my 'island'. I put up the leaves when I need the extra space to work or eat, and drop them when I don't. (I have it against a short wall, not in the center of the kitchen.) It looks nice and is quite functional. Kim! Great idea!!!! And a fun way to make one's furniture look like a set. Glad you kept your kids engravings, that is priceless!! That really is the best part...and even as teens they keep engraving. More fun for me! ;) Good thing I'm a sentimentalist! Kim, if I were to list all the things in my house/to do list that came from you, I'd have to rename my list to "Kim's brilliant ideas!"